Most fighters get only one act. Their careers rise and fall like a dramatist’s plot structure, with a chosen few enjoying a longer arc than their peers. Rarely, after one’s rise climaxes, do they receive a second act. Never are they granted three. But when Steve “The Boss” Bossé steps into the boxing ring at the Montreal Casino on February 15, the 36-year-old will do so as a three-sport pugilist. It has been a rare and concussive ride. Today, Bossé’s focus is boxing. Last November, promoter Yvon Michel announced he had signed the former hockey goon and UFC fighter to a contract, marking an important development for both men. Bossé’s athletic career encompasses each stream of Quebecois fight culture, and his reputation is something that Michel — once the country’s most powerful promoter and now the seer of a depleted stable — will leverage into ticket sales. To understand Bossé’s path is to survey the provincial fight scene, where violence and theatre have coalesced for decades. From it, he fashioned one of the most unique careers in Canadian history. This story is an arc in three acts, the third of which is about to be written. 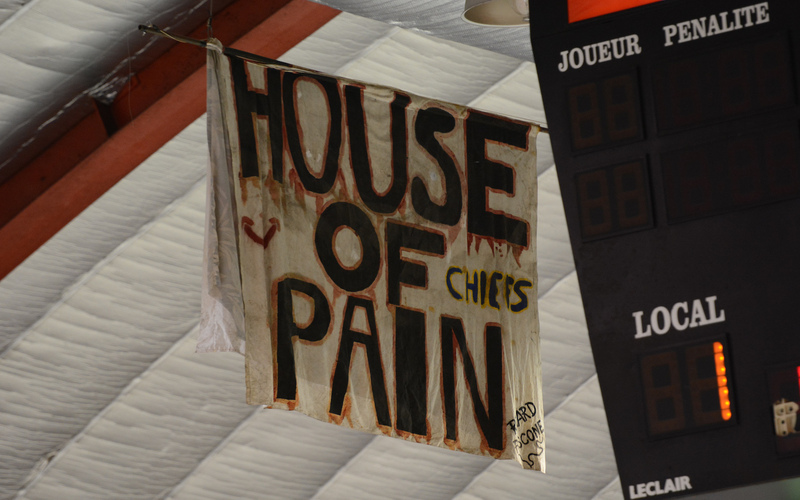 Hanging from the Colisée’s rafters, this banner promised opponents a bad time. 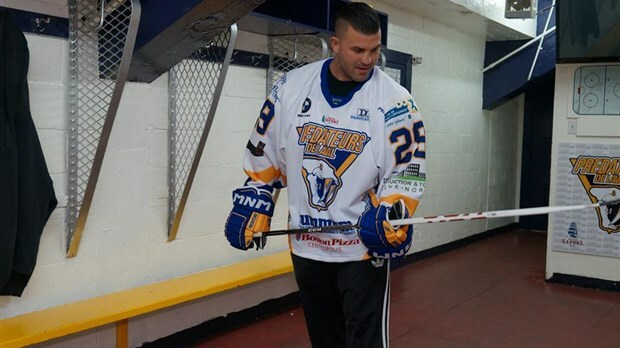 That same year, Steve Bossé, an LNAH legend who’d spent the previous five years focused exclusively on MMA, emerged from his hockey exodus to join the upstart Laval Prédateurs. He appeared in five games but had 47 penalty minutes, and among these infractions are the following highlights. At 0:45 in this video Bossé drops an opposing player with a bare-handed punch and then challenges the injured man’s bench. At 5:30 here he grants the same team a similar offer, appearing before them like a cocksure vagabond strutting into a new saloon. Bossé, wielding an instrument he had little use for as a hockey player. Bossé’s 2014 LNAH return was a celebrated event, but to gain a sense of the environment in which his fame was made, I recommend the following video. In it, Link Gaetz, a former NHL enforcer and cult figure in hockey circles, takes on Jason Hamilton. What follows can’t be characterized as a ‘fight’ in the traditional sense as two men take baseball swings at one another near center ice. Instead of being ejected, they’re led to the penalty box where insults morph into water bottle spray and a resumption of stick swatting. Hamilton then leaps over the timekeeper to jump Gaetz and their rumble continues within “The Missing Link’s” confined space. Depending on your outlook, the video will provide a dose of nihilistic amusement or repel you by its barbarism. Objectively entertaining, though, is the announcer’s frenzied speech, which veers from horror (“Come on, come on, this is no longer hockey!”) to awe (“What a fight!”). The Gaetz-Hamilton incident is a singular event, and one that does not involve Steve Bossé. But it functions as a demonstration of the spectacle that filled small town rinks across Quebec throughout the 2000s, a spectacle that centered its promotion on the violence wrought by men like Gaetz, former NHLer and bank robber Patrick Coté, and eventually Steve Bossé. To return, then, to The Montreal Gazette and the writer’s description of the rink as a bastion of cultural decay: this is fine rhetorical flourish, but if the Colisée was a modern Coliseum, southwest Montreal’s Verdun Auditorium, where Bossé broke into the LNAH in 2003, was a killing field. In his first year of semi-pro hockey, the Verdun Dragons compiled 343 fighting majors in 50 games, or nearly seven per night. Bossé finished third among Dragons in scraps, directly behind Joel ‘the Animal’ Theriault, an ornamented minor league heavyweight and aspiring boxer, whose career ended last June when he mauled opponent Oswego Oltega in Thetford Mines. 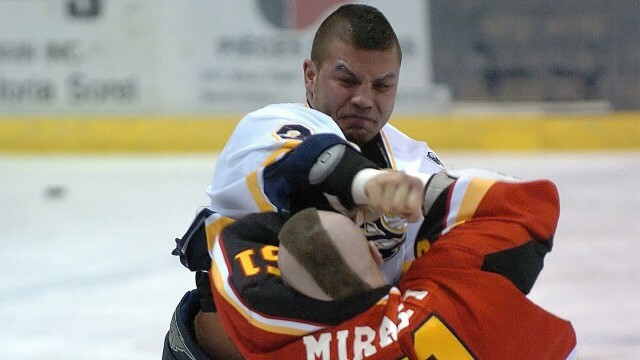 Bossé overcomes LNAH rival Jon ‘Nasty’ Mirasty. As Bossé matured, he became one of the LNAH’s premiere heavyweights, and his right hand had become the scourge of hockey hard men from Montreal to Jonquière. In 2005-06, “The Boss” had one of the most successful fighting seasons on record, thrice knocking out Jon ‘Nasty’ Mirasty, himself a fabled minor league fighter, and doing away with several more challengers. He had become a hero in many of Quebec’s hockey towns, proving himself against everyone, including, memorably, former teammate and friend Theriault. Note their helmet toss at the beginning. The frequency with which he fought taught Bossé how to cope with the psychological stress of fighting, and his natural facility ensured a consistent result. As the knockouts mounted, his reputation grew to where Bossé started drawing attention from outside of hockey. As mixed martial arts exploded in North America, he fielded a call from Quebec promoter Stéphane Patry, who urged Bossé to appear on a local MMA show in June of 2007. “The Boss” won his first bout via stoppage and, while he continued to appear in the LNAH over the next two seasons, his fighting path had taken a new direction. From 2007 until 2013, Steve Bossé won all but one of his first 11 MMA fights, all of which took place in the Montreal area. In his fourth match, he submitted the six foot nine inch Wes Sims by ankle lock; in his eighth, Bossé decisioned UFC veteran Marvin Eastman, a victory notable not only for his competition but since it came via decision. But the win that legitimized Bossé as a mixed martial artist and demonstrated that he was more than a street fighter on skates from a league few took seriously, came against UFC veteran Houston Alexander in 2011, who he crumpled with an elbow to the head. He then earned a bloody stoppage over Caleb Grummet in his next fight. But however swift his rise, the career of “The Boss” stopped moving quickly. Two years elapsed between his victories over Alexander and Grummet, and then, in 2014, only weeks after Bossé signed his first contract with the UFC, he retired, declaring his body too ravaged, and his soul too calm, to continue fighting. Bossé stops UFC veteran Houston Alexander with a vicious elbow. In 11 years, the firefighter from Saint-Jean sur Richelieu had established himself in two sports and found inner peace. But however much serenity this success brought, Bossé’s inner storm invariably returned, and one year later the 34-year-old gladiator emerged from retirement to make his debut at the sport’s highest level. 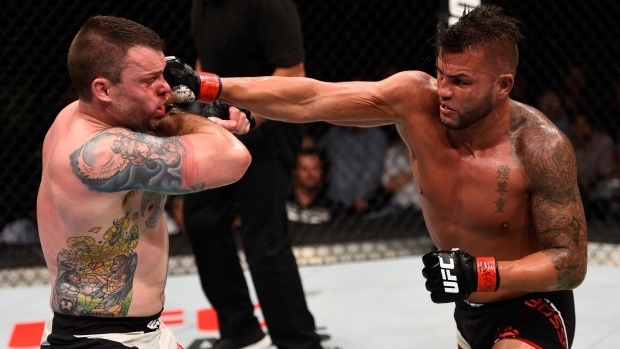 In June 2015, he faced Brazilian Thiago Santos on an Ultimate Fighting Championship card in Hollywood, Florida. That night, Bossé received a cruel introduction to the MMA elite when he was felled by a head kick 29 seconds into the first round. It would be nine months before he fought again, when, in March 2016, he journeyed to Australia and stopped James Te Huna in Brisbane, turning the Aussie’s lights off with a precise left hand. “The Boss” lands a right hand on Sean O’Connell. The O’Connell win is Steve Bossé’s finest moment as a mixed martial artist. It drew upon the indomitability he first showcased in the LNAH, whose theatrics Bossé imported to the octagon that night when he high-fived O’Connell during one of their exchanges. It was a show worthy of his pedigree, and one that should have ensured premium slots on future events. And then Steve Bossé’s run in the UFC ended. On February 15, Bossé will step into a professional boxing ring for the first time versus Bolivian Julio Cuellar Cabrera. He will do so 18 months after his win over O’Connell, and fighting under the banner of Groupe Yvon Michel, a company that’s hemorrhaged stardom in the past year. 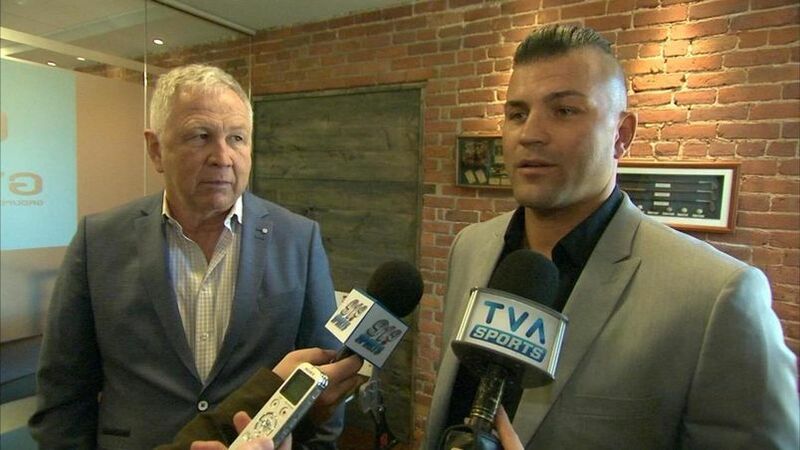 In November 2016, speaking at a press conference in Gatineau to promote Artur Beterbiev and Custio Clayton, Michel said he believed Montreal was entering into a new golden age for boxing, one that, presumably, he would largely preside over. But two years later, his relationship with Beterbiev is irreparably fractured, and Clayton has aligned himself with Camille Estephan’s Eye of the Tiger Management. Estephan’s company has established itself as the city’s top firm, and to heap further injury upon GYM, it may soon announce the signing of super middleweight Erik Bazinyan, an excellent prospect who recently defected from Rixa Promotions. 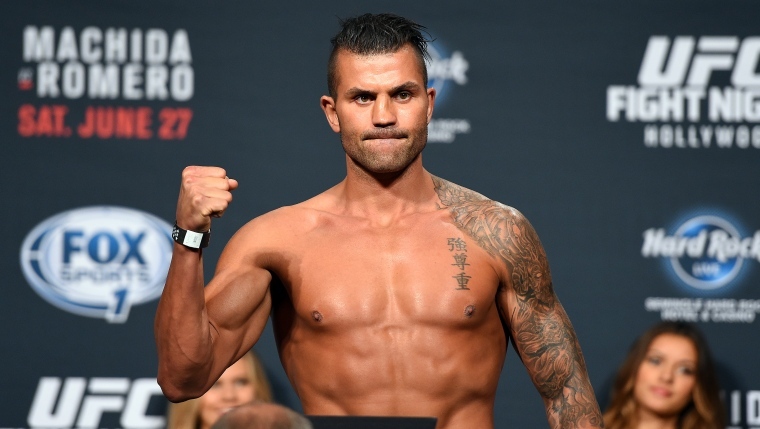 This makes Bossé’s acquisition a shrewd but necessary move by Michel, as the fighter’s reputation will intrigue those familiar with his two previous careers. At the announcement of his signing, Bossé and Michel spoke of chasing some of the light heavyweight division’s former stars, like Bernard Hopkins, Roy Jones, Lucian Bute and Jean Pascal, whom they may try to coax out of retirement with the tantalizing prospect of taking on a virginal boxer with UFC credentials who can sell tickets. This may sound unrealistic, but, as we all know, it’s been done before. Michel, left, hopes that Bossé can help resurrect his business. Returning to GYM, can Steve Bossé save the once-dominant company? In a word, no, that is much too tall an order for a 36-year-old athlete with no professional boxing experience. But he can help, so long as Bossé shows the same native talent that distinguished his two previous pursuits. The biggest question is the state of his body, long ravaged by injury, and whether it can withstand the rigours of a damaging sport. There is an easy parallel here with Conor McGregor, but that would cheapen Bossé’s level of commitment. Anyone familiar with his past can testify to the absolute seriousness with which he approaches combat, a seriousness that made his transition from hockey to MMA possible. He is a remarkably tough character who fights with a vow to entertain, and without having seen him box it seems a reasonable assumption that Bossé will bring the same style to the ring that first popularized him: aggressive, brutal and relentless. Bobby Gunn. the king of bare knuckle boxing and former cruiserweight champion, he is the fighter Steve Bosse needs to fight in Montreal.